Posted on 1/11/2010, 7:21 pm, by sweets4ever, under Home Sweet Home. 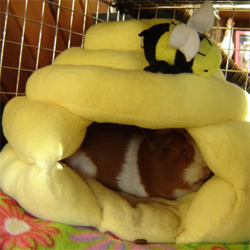 We could only hope to be as cozy and warm as this little guinea pig in her adorable beehive hidey house. Chubby Pixie shared that she made this hidey house from fleece as part of the garden-themed cage accessories for her girls. Be sure to check out her holly hammock and present hidey house, too! Awww! I love small mammals and making “homes” for them. I once had an creamsicle colored mousie named Dolce, and we built him a castle. It was awesome and I would take a picture to show, but when he died he had a big funeral and was buried in it:D This is to cute, love it!